As a run up to our article yesterday about the compromised Media Institute for Southern Africa MISA Zambia board, Chairperson Hellen Mwale and three other board members misled the two others into unlawfully suspending a known media freedom defender Wilson Pondamali. Hellen and one of her boyfriends Kellies Kaunda who is press aide in Germany have stolen money from MISA. 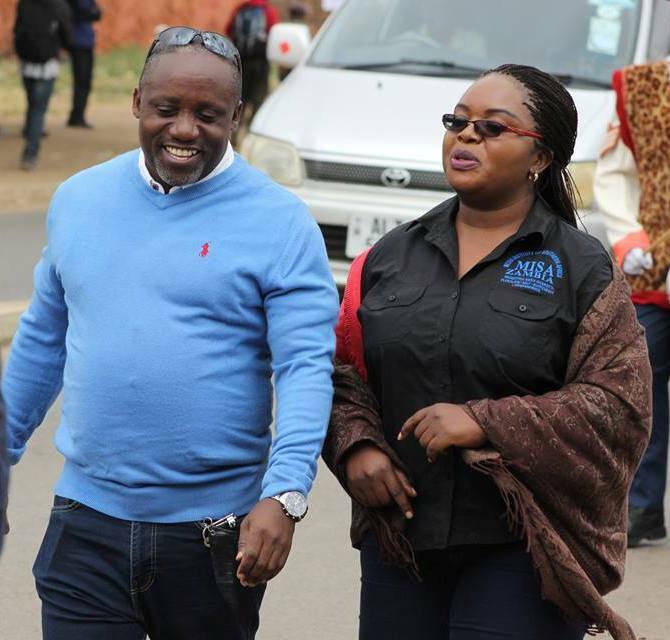 Hellen has a tainted background starting from the teenage pregnancy she got which saw her have her only daughter to now clinging upon another Copperbelt man Steward Mwewa who is a Kitwe based PF cadre famous for illegal contracts. This was after flirting about with a retired Major Mwamba from the ZAF whom she helped wipe out his retirement benefits and the ex soldier is now a sorry sight. While working at the Daily Nation, Hellen was being bonked by the owner of the newspaper ex convict Richard Sakala but because Sakala was keeping another concubine in the name of Patricia Chibiliti Hellen and Patricia were always at each other’s necks hence being sent into resignation. But what Patricia, younger sister to former secretary to the cabinet Evans doesn’t know is that Sakala still bonks Hellen privately and she is the one editing the Daily Nation online newspaper hence her quick statement when the company was found in a stage managed Petrol bomb scare. Really who would want to kill Sakala or let alone bomb his premises when the man can easily be found? This is part of the tainted life of Hellen Mwale in whose leadership MISA has been for the past four years. At the moment she is trying to evade a vote of no confidence which the members have put in motion and with the expose of suspending Pondamali the members feel agitated and speeding up the call for an extra ordinary General meeting. The Watchdog has information that one of the things Hellen and her minions want Pondamali is to block him from filing for chairmanship because they fear that their pay masters will be under attack. Hellen is also fearing that Pondamali will expose her other boyfriend Kellies Kaunda the Press aide to Germany with whom they jointly swindled MISA out of money and has been pleading with other board members to write of that illegality but Pondamali has refused to be part of the collective irresponsibility, this is one of the charges they are slapping on Pondamali when they say failure to abide by board decisions. Tomorrow we shall write about her professional experience and how she has betrayed journalists, some of the radio stations have been shut with her full awareness and endorsements. We challenge her on what her comments were when Lesa Kasoma of Komboni Radio was assaulted after the radio station was closed. After Hellen we shall expose another of her boyfriends, Hyde Haguta who was recently part of the journalists who were feted by Sahara Oil in Nigeria and Ghana but Haguta has since unfortunately been fired by Radio Phoenix. ZWD advise to Pondamali and other MISA members: Go ahead and hire a top flight lawyer to obtain a court order to restore your membership and stop the cartel from plundering resources till your matter is determined by the AGM. Other members must continue with the petition for the removal of this incompetent board. The donors must keep faith and not completely withdraw their support, we understand their frustrations.